We know what to do; we just need to do it. How do early education and care professional travel from knowing to doing? The report offers a blueprint with 13 recommendations for local, state, and national action. The goal is to build “a unifying foundation” by improving the professional training and practices of the birth-through-8 workforce. The report has won praise from NAEYC (the National Association for the Education of Young Children). Check out NAEYC’s press release or the full IOM report to read all the recommendations. A Bachelor’s degree is a must. But – we need to be more specific and more rigorous in relation to this requirement. As someone on the front lines for 28 years, I am now watching paraprofessionals pursue a B.A. This is not enough. I believe they need to complete a supervised practicum – probably 2 of them in different grade levels- and pursue a state dept. of education license. (i.e. 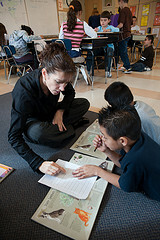 MA DESE not EEC) A practicum makes a huge difference in preparing to teach young children. The courses are simply not enough. This is the only solution to creating a highly qualified workforce. And, of course, they will need to be paid more as a result.